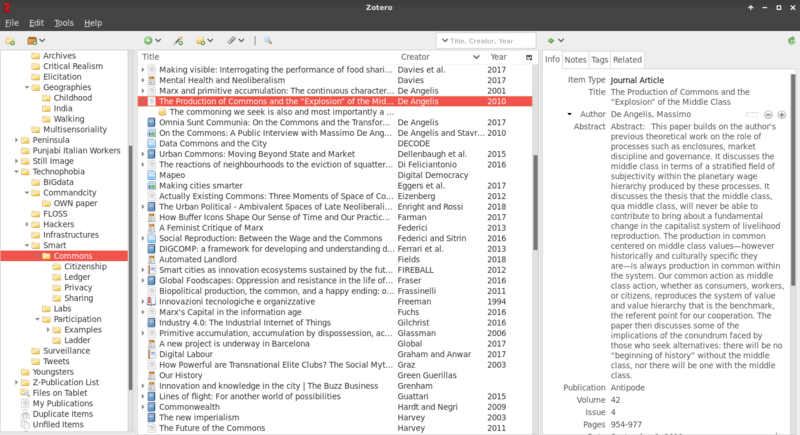 Zotero is a Free and Open Source, cross-platform, reference manager that integrates with your browser and word processor – it offers now a ‘My Publications’ folder which is automatically published to your Zotero profile page, see mine here →→→ see my entire Zotero library. Screensaver borrowed from Sarai‘s old website. (forthcoming) Cardullo, P., & Roio, D., Mesh Networking, Wiley Blackwell Encyclopedia of Sociology, 2nd edition. SocArXiv pre-print @ Open Science Framework. (2018) Kitchin, R., Cardullo, P., & Di Feliciantonio, C., Citizenship, Justice and the Right to the Smart City. The Programmable City Working Paper 41, 17 October 2018, SocArXiv pre-print @ Open Science Framework. (2018-19) Commoning the smart city: A case for a public Internet provision. SocArXiv pre-print @ Open Science Framework. (2018) Cardullo, P. & Kitchin, R., Smart urbanism and smart citizenship: The neoliberal logic of ‘citizen-focused’ smart cities in Europe. The Programmable City Working Paper 39, 9 March 2018. SocArXiv pre-print @ Open Science Framework. (2018) Cardullo, P. & Kitchin, R. Being a ‘citizen’ in the smart city: Up and down the scaffold of smart citizen participation in Dublin, Ireland. GeoJournal, pp. 1–13, DOI: 10.1007/s10708-018-9845-8. Read-only available. (2017) Cardullo, P. & Kitchin, R., Being a ‘citizen’ in the smart city: Up and down the scaffold of smart citizen participation. The Programmable City Working Paper 30. SocArXiv pre-print @ Open Science Framework. (2017) Cardullo, P. & Kitchin, R., Living Labs, Vacancy, and Gentrification. The Programmable City Working Paper 27. SocArXiv pre-print @ Open Science Framework. (2017) Gentrification in the mesh? An ethnography of Open Wireless Network (OWN) in Deptford, City, Routledge; DOI: 10.1080/13604813.2017.1325236 →→→ SocArXiv pre-print @ Open Science Framework. (2017) CCTV oddity: Archaeology and aesthetics of video surveillance, Visual Studies, Routledge. DOI: 10.1080/1472586X.2017.1328988 →→→ SocArXiv pre-print @ Open Science Framework. (2015) Earthquake in the city: The people yet to come, co-authored with Prof. M. Russo, University of Modena, DEMB Working Paper Series N. 63. Available here. (2014) Sniffing the city: Issues of sousveillance in innercity London, Visual Studies 29.3, Routledge; DOI: 10.1080/1472586X.2014. (2012-14, working paper) CCTV oddity: Playing up video surveillance, in: CAST University of Copenhagen and Politics Department University of Turku, Visual Aspect of Security workshops. (2013) #OCTV in collaboration with James Stevens @ spc, at the International Visual Sociology Association annual conference, Goldsmiths University of London. Dataset available from SocArXiv.